Like many of her friends, Safia Alhassan spends much of her free time either picking the ripe fruit that have dropped from the millions of Shea trees dotted around here, or turning the kennels into butter. She’s been doing this since she was 8 when her grandma showed her the ropes. Today Alhassan is happy. Happy that after years of talking and planning, change is finally coming to how she and her friends do business. One that is sure to bring them more cash. Giant warehouses are being built for storage of these kernels for women who toil at the lowest ebb in the Shea industry. And they get to have them for free. Shea is used in millions of confectionary products by various companies like the candy giants Hershey’s and Nestle. But it is more known for its hair and skin nourishment properties in cosmetics from the likes of L’Occitane en Provence, Burt’s Bees, the Body Shop and Sundial. “Some of us are not able to store our nuts and butter that we produce in bulk,” Alhassan, 56, said. They end up storing them amidst their other belongings in their tiny one-room huts. “Sometimes we have to bathe in our rooms. Sometimes we cook in the room when it rains. And with children already one space is being used for so many activities. It is a really small space to spread the mats in,” she said. In the last decade the Shea industry has nearly doubled in size providing employment for an estimated 16 million poor and rural women in 21 African countries. At the same time it has gained traction in the West and is now prominently labeled as a key ingredient in many products. For many of these women here in northern Ghana, collecting the nuts and then making the butter must not interfere with domestic duties. So pickers here do it before dawn, so as to be home in time for breakfast and farming. These women don’t own land or property so Shea often is their only income outside of what their husbands bring in and control. However the smell of the raw kernels is pungent enough that if a husband doesn't want too many stored in the home, out it goes. Alhassan, who heads the Pansung Shea butter processors & Shea nut pickers Association, a cooperative of 1,600 women, is a Home Economics teacher by day. She knows that even though the women make little money from Shea, they can make more. Shea picking is one of the few industries dominated by women: They pick the fruit, store the nuts, then process them to make butter and soap. And then they sell them. But the Shea harvest season is only from May-July, so Alhassan says it is essential to store nuts somewhere so processing can continue year round. Once the season ends, or if the pickings were slim, they cannot continue processing the butter if there is no place to store them. And so many have to sell them at rock bottom prices. “Then they have buy them back at much higher prices so they can process butter later in the year. Warehouses would a great help to us,” Alhassan added. In 2008, the Japanese Embassy gifted Pansung small warehouse spaces and that made a difference, but only a fraction of the women can access them. 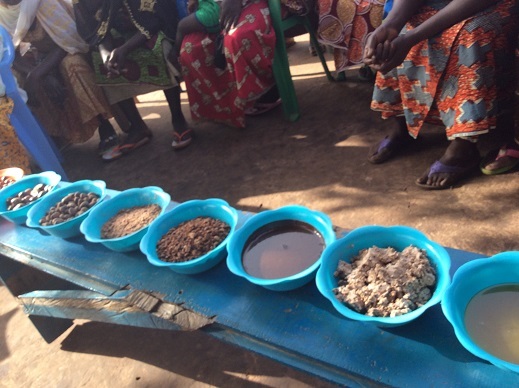 So after 24 months of a working group devoted to sustaining Shea that included buyers, sellers, processors and producers, all brought together by the trade group, the Global Shea Alliance, (GSA) storage space emerged as the Number 1 priority. So some 250 100-ton warehouses are being built by the GSA to be donated to women’s groups in Ghana, Nigeria, Burkina Faso, Mali, Cote’d’Ivoire and Benin Republic. The $10 million estimate is to be funded by members of GSA. So about 137,000 rural women collectors will be able to store two 85-kilo sacks annually. And once all 250 warehouses are in use, in about five years, GSA estimates that at least 25,000 tons or 7 percent of Shea exports from Africa will be traceable. And that makes manufacturers and retailers happy. The alliance is currently run by Joseph Funt, an affable New York transplant who spent years running a community service organization in Brooklyn before de-camping to the GSA in 2012. For the project to succeed the team based in Ghana’s cosmopolitan capital Accra, -- 270 miles and a 12-hour drive away -- has to ensure that the collectors pick unblemished nuts. So GSA spends considerable effort training in the local languages on best practices in storage, quality collections and even accounting. “If these groups are going to sell in bulk, they have to be able to manage contracts." he added. When Funt first arrived in Ghana, GSA’s main funder was the American taxpayer. It was a small project of the West Africa Trade Hub. Trade hubs are part of the development strategy of American government funded by the United States Agency for International Development, (USAID). While most people associate Shea butter with cosmetics, only 10 percent ends up for cosmetic use. The other 90 percent ends up in confectionaries as a vegetable fat. Whoever the end user is doesn't matter to the women who do the picking as long as more people want the products. For over two decades, Anna Maria Fati Paul, has worked as a trustee to the Tungteiya Women’s Association in the nearby hamlet of Mbanaayili, nine miles away. Mbanaayili is rural village with dirt paths, grazing cows and mud huts. One needs permission from the village chief before entering and walking around. Paul said while picking Shea for processing is difficult work, it is also frequently dangerous, particularly at 4:00 a.m., when the ladies set out. Once Shea is ripe, it simply drops off the tree. It is never plucked. “There is a lot of competition for the Shea. We have snakes rushing for it. Bats, rushing for it, rats, mice, all the creatures that you can imagine in the bush all want it because it taste good,” Paul, 74, said. Because of frequent snakebites, monies the Tungteiya women have earned have gone towards building the village its first clinic and accommodation for nurses to remain there. Most medical personnel and teachers have troubling staying over in such rural settings so Shea earnings have been used to get homes for teachers too. Tungteiya has been rather successful because for 26-years, the women have been supplying the Body Shop company. It started slow but now they sell up to 450 metric tons of butter annually. The women, mostly married mothers, work in an enclosure in which their animals, (fowls or goats) and little children aren’t allowed inside to ensure the purest form of Shea gets processed with zero contamination. On a recent visit babies were looked after by older members while the younger mothers worked. Other children played outside, looking in sometimes, but forbidden to enter. Tungteiya women are planning on building their own warehouse and through the GSA have applied to USAID for matching funds to complete their project. Their hope is to add another big name buyer. When the women process the butter, -- an arduous traditional process which involves stirring a concoction for long periods after the nuts have been boiled -- they easily get boils. This African savannah that is home to the Shea tree doesn't necessarily have unlimited trees. Yes the tree grows wildly across it but they cannot be farmed easily. The tree roots go deep and outward so planting them in an industrial farm setting is tough. The trees are always in danger of being cut for firewood or charcoal. Or worse. Hussein Zakaria, a longtime imam at the Tamale Central Mosque points out that youth in the area often go into the bush to set fires to get rodents to run, so they can then be easily hunted for food. But those brush fires he said, harm Shea trees. “The annual bush burning affects a lot of the trees and they are unable to produce to their fullest capacity. It is one of the most disastrous activity that we keep making noise about but we are unable to stop it,” he said. GSA officials are also exploring other ways at conservation including encouragement of inter-cropping. That is encouraging people to plant other crops that thrive near the Shea trees that way the land is arable and Shea remains plentiful. But for now Alhassan and others are thinking warehouses, warehouses, warehouses. She is hoping to get assistance for tricycles so women can go deeper into the forest and pick more nuts. Currently each woman only picks what she can carry on her head in a small pan. Frankie Edozien is a journalist, writer and academic. He is a media professor with New York University.